New York - Xo Communications today announced plans to sell major portions of its network assets to Verizon for $1.8 Billion. 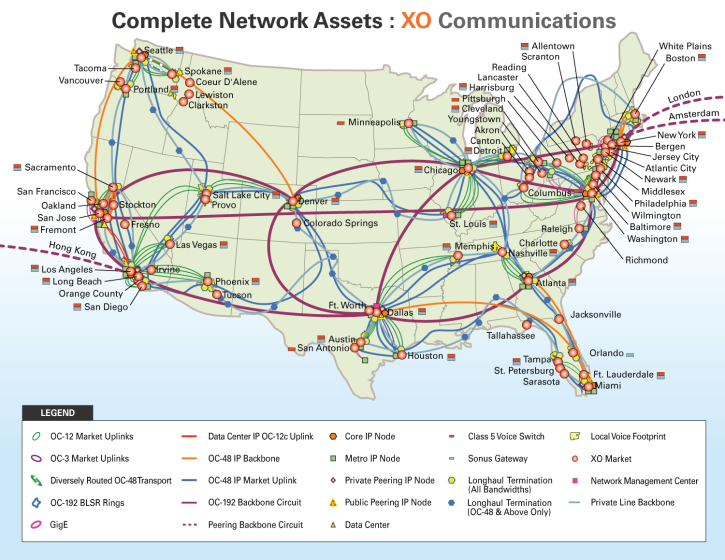 Among the assets included are Xo's entire nationwide fiber network and fiber-based IP and Ethernet networks. Verizon is also agreeing to lease wireless spectrum licensed to Xo with an option to purchase it at a later date, pending FCC approval. The company currently owns 102 wireless licenses across the country in the 28 and 39GHz range, which covers 45% of the U.S. population. Verizon has stated that it intends to use the spectrum as part of its upcoming migration to 5G. Xo's 1.2 million miles of fiber will help Verizon to greatly expand its wireless backhaul capacity and increase its footprint to enterprise customers, who currently make up about 10% of its overall business. Verizon cited long-term cost savings as one of the key reasons for the purchase. The purchase price does not include Xo's current customer base, which is a separate asset. Xo Communications is headquartered in Herndon, VA and owned by billionaire investor Carl Ichan. The deal is expected to close in early 2017.